David Busch's Nikon D5600 Guide to Digital Photography is your all-in-one comprehensive resource and reference for the Nikon D5600 camera. This ultracompact and light weight Nikon digital SLR has new SnapBridge wireless Bluetooth communication so you can use your iOS or Android device to control the camera. Nikon has also added an easy-to-use time-lapse feature to its impressive capabilities, which include a swiveling touch screen LCD that makes taking photos or changing settings quick and easy. The D5600 captures 24-megapixel still images and 1080p 60 fps high-definition movies with stereo sound, too. With this book in hand, you can fine tune your camera skills as you explore the world of digital photography, develop your creativity, and take great photographs with your D5600. 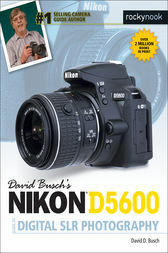 Filled with detailed how-to steps and full-color illustrations, David Busch's Nikon D5600 Guide to Digital Photography covers all the camera's features in depth, from taking your first photos through advanced details of setup, exposure, lens selection, lighting, and more, and relates each feature to specific photographic techniques and situations. Also included is the handy visual guide to the D5600, with close-up photos and descriptions of the camera's essential features and controls, including the versatile LCD touch screen. Learn when to use each option and, more importantly, when not to use them, by following the author’s recommended settings for every menu entry. With best-selling photographer and mentor David Busch as your guide, you'll quickly have full creative mastery of your camera’s capabilities, whether you're shooting on the job, as an advanced enthusiast, or are just out for fun. Start building your knowledge and confidence, while bringing your vision to light with the Nikon D5600 today. With more than two million books in print, David D. Busch is the world’s #1 best-selling camera guide author, with more than 100 guidebooks for Nikon, Canon, Sony, Olympus, Pentax, and Panasonic cameras, and many popular books devoted to digital photography and imaging techniques. His best-sellers include Digital SLR Cameras and Photography for Dummies, which has sold more than 300,000 copies in five editions, and Mastering Digital SLR Photography, now in its Fourth Edition. The graduate of Kent State University is a former newspaper reporter/photographer, and operated his own commercial photo studio, shooting sports, weddings, portraits, fashion, architecture, product photography, and travel images. For 22 years he was a principal in CCS/PR, Inc., one of the largest public relations/marketing firms based in San Diego, working on press conferences, press kits, media tours, and sponsored photo trade magazine articles for Eastman Kodak Company and other imaging companies. His 2500 articles and accompanying photos have appeared inside and on the covers of hundreds of magazines, including Popular Photography, Rangefinder, and Professional Photographer. For the last decade, Busch has devoted much of his time to sharing his photographic expertise, both in publications, and in seminar/workshops he hosts at the Cleveland Photographic Society School of Photography. He has been a call-in guest for 21 different radio shows nationally and in major markets, including WTOP-AM (Washington), KYW-AM (Philadelphia), USA Network (Daybreak USA), WPHM-AM (Detroit), KMJE-FM (Sacramento), CJAD-AM (Montreal), WBIX-AM (Boston), ABC Radio Network (Jonathan & Mary Show). He’s also been a call-in guest for one Canadian television show, and appeared live on Breakfast Television in Toronto, the Today Show of the Great White North.